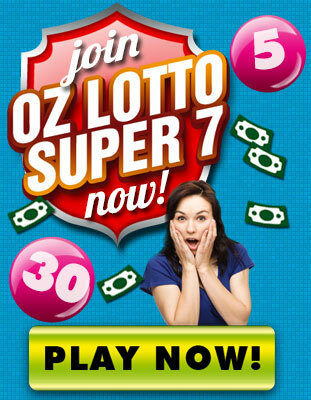 Oz Lotto Super 7 is a popular 7/45 lotto game played in Australia every Tuesday. Oz Lotto currently holds the record for the largest Australian lotto jackpot prize. Originally guaranteed at $100 million, four winners shared a Division 1 pool of $111,972,151.04 in the draw on 6 November 2012. Oz Lotto Super 7 features 7 winning numbers, plus 2 supplementary numbers drawn from 45 balls. The supplementary balls are used to determine prizes in Divisions 2 and 7, and have effectively increased winning odds from 1-in-210 to 1-in-55. In fact, Super 7's pilot draw delivered a record 96,314 winners –over four times the previous OZ Lotto average! The two newly created prize divisions alone generated a whopping 94,739 winners. Since then, Super 7 has delivered on its promise of bigger jackpots and more cash prize winners! To win a prize you need to get at least three of the winning numbers from 45 and one or both of the supplementary numbers in any one game. The more winning numbers you're playing, the higher your prize! OZ Super 7 is not being offered on this site at the moment, but rest assured that you will be kept informed of any OZ Super 7 Draws in the near future. To play in one of our featured lotteries, please visit http://www.osalottos.com.